We’d love your help. Let us know what’s wrong with this preview of Cover Girls by T.D. Jakes. A compelling novel of real faith that follows four African-American women throughout one year as they learn to balance children, estranged husbands, boyfriends, and problems at work with their heartfelt belief in God. 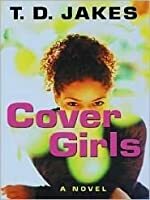 To ask other readers questions about Cover Girls, please sign up. This book is by Bishop T.D. Jakes who often appears on the Dr. Phil television program. It was interesting because Bishp Jakes believes that there are four seasons in a woman's life. Spring is the first season when a girl relies on care, protestion and nurturing to grow into a lovely flower. Summer is when the "seeds" planted in youth begin to fully bloom. Fall is when the strength shows, great peace and settling into who she is and what she will become. Winter is when her life is not done or fin This book is by Bishop T.D. Jakes who often appears on the Dr. Phil television program. It was interesting because Bishp Jakes believes that there are four seasons in a woman's life. Spring is the first season when a girl relies on care, protestion and nurturing to grow into a lovely flower. Summer is when the "seeds" planted in youth begin to fully bloom. Fall is when the strength shows, great peace and settling into who she is and what she will become. Winter is when her life is not done or finished but she may have new things in her life. great book!! this is my first book I have read by T.D Jakes, and it will not be my last. the people in the book had their only little stories which was great . It shows and explains how everyone has their season that their going through whether it be winter spring summer or fall. It is a wonderful read ! Do your best not to take a person's actions to personal because you never no the person's story. Basically everything is not what it seems. It could just be a cover or they envy you because you are in the position where they wish to be. I can't believe T.D. Jakes wrote this with his scary looking self. Doesn't he look like Mr. Brown from the Madea plays? Anyway, he seems to be really in touch with the female mind...it's scary...or either he's lying. Only God knows. like this book also attented the play it was relly good read and see if any of the women you might know or you may find one of them in yourself ... let me know ! Absolutely loved this book! It made me shout hallelujah and praise God all at the same time. T.D. Jakes is another one that cease to amaze me. I was pleasantly surprised when I found this book at our local library. It looked interesting, so I decided to check it out. I'm glad I did. It was a very good story. I want to believe that the four characters in this book represented the best (and worst of us). I was joyful to see good triumph over evil. I enjoyed reading this book. It's a pleasant surprise to read about the struggles of women from a male author. 3* It was something to read... not fabulous but okay. I like all of TD Jakes books. This is his first novel and it is well done. I loved the ending especially...it made me think about my own past life. Very Good!!! Finished better than it started . . . ;). Great. I think ever woman coming into her own should read this book. It's an eye opener. I abandoned this story after 25 pages. Perhaps I will give it another chance at some point, but I couldn't get past the slangy tone of the writing. This surprised me because I am generally attracted to slang from all cultures. However, the black urban hipster tone of this book smacked me in the face from the first page. As a black girl, I hear plenty of this speech pattern in real life and it doesn't bother me. It can actually be quite funny when used properly. In writing, it comes off as stilte I abandoned this story after 25 pages. Perhaps I will give it another chance at some point, but I couldn't get past the slangy tone of the writing. This surprised me because I am generally attracted to slang from all cultures. However, the black urban hipster tone of this book smacked me in the face from the first page. As a black girl, I hear plenty of this speech pattern in real life and it doesn't bother me. It can actually be quite funny when used properly. In writing, it comes off as stilted. Excellent book that speaks to real situations. At times the writing can be pedestrian, but the content as a whole out shines that flaw. Bishop Jakes does a phenomenal job of speaking truth to real women's experiences. Most of us know of a Miz Ida, she represents many grandmothers or church mothers across the nation. The characters in the book are real and relatable. There are truths here that can help any woman whose been in any of these situations. Worth the read! It was a read on the different stages women going through (using the seasons as a metaphor). Some of the characters were underdeveloped though so it left a lot to be desired. Some of the scenarios just weren't believable at all! Amen, in Jesus name, Amen!!!! Read this it my reach your heart. Predictable at best, I was excited that he branched out but I was not thrilled with this read at all. Got to chapter 6 but couldn't spend any more time reading it. Just wasn't engaging. Sometimes you need a good book like cover girls to bring you back to reality. You never know what the next woman is going through. A community is healing. Yes God; please help us to be better and not vinegar!
. The book is about 3 women whose lives’ intertwine with each other. There are seasons in nature, and season in our life. It is amazing how God bring people together to teach us lessons. People come into our life for different reasons even if it is only for a season. Decent book!! !